Die Veneris, 15 Aprilis, 1642. Petition against King's going to Ireland. ORDERED That Sir H. Vane shall have Liberty to transport over into Holland, for the Use of Two of his Sons, Two Horses more than were granted by a former Order. 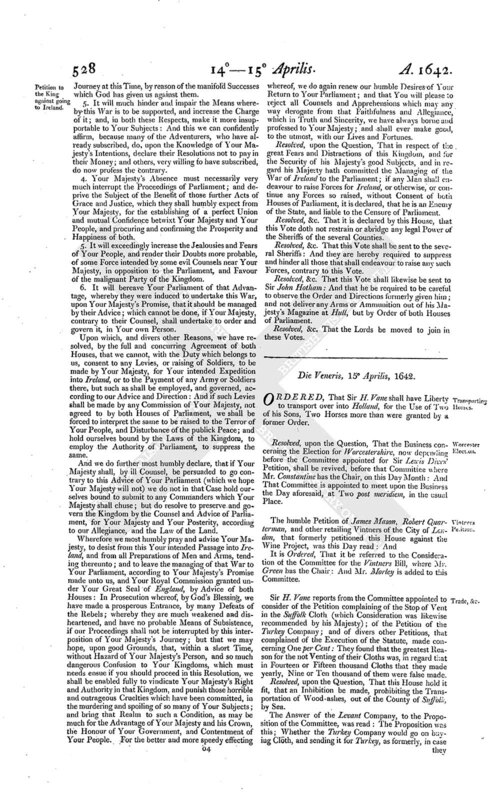 Resolved, upon the Question, That the Business concerning the Election for Worcestershire, now depending before the Committee appointed for Sir Lewis Dives' Petition, shall be revived, before that Committee where Mr. Constantine has the Chair, on this Day Month: And That Committee is appointed to meet upon the Business the Day aforesaid, at Two post meridiem, in the usual Place. 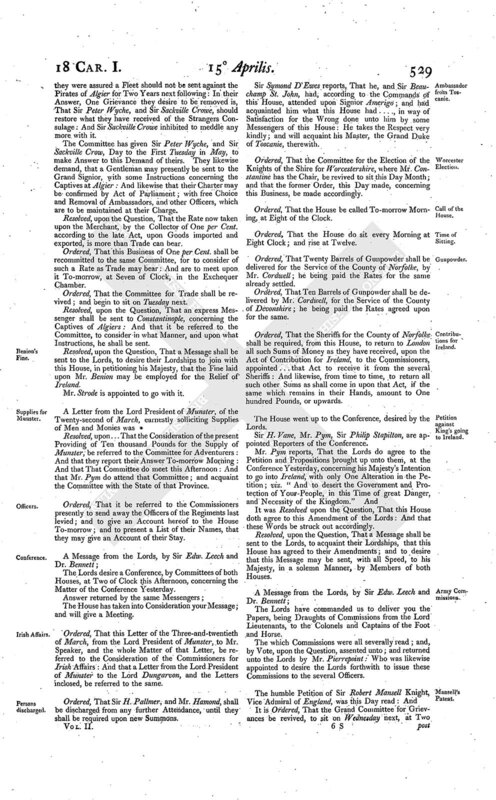 It is Ordered, That it be referred to the Consideration of the Committee for the Vintners Bill, where Mr. Green has the Chair: And Mr. Morley is added to this Committee. Sir H. Vane reports from the Committee appointed to consider of the Petition complaining of the Stop of Vent in the Suffolk Cloth (which Consideration was likewise recommended by his Majesty); of the Petition of the Turkey Company; and of divers other Petitions, that complained of the Execution of the Statute, made concerning One per Cent: They found that the greatest Reason for the not Venting of their Cloths was, in regard that in Fourteen or Fifteen thousand Cloths that they made yearly, Nine or Ten thousand of them were false made. Resolved, upon the Question, That this House hold it fit, that an Inhibition be made, prohibiting the Transportation of Wood-ashes, out of the County of Suffolk, by Sea. The Answer of the Levant Company, to the Proposition of the Committee, was read: The Proposition was this; Whether the Turkey Company would go on buying Cloth, and sending it for Turkey, as formerly, in case they were assured a Fleet should not be sent against the Pirates of Algier for Two Years next following: In their Answer, One Grievance they desire to be removed is, That Sir Peter Wyche, and Sir Sackville Crowe, should restore what they have received of the Strangers Consulage: And Sir Sackville Crowe inhibited to meddle any more with it. The Committee has given Sir Peter Wyche, and Sir Sackville Crow, Day to the First Tuesday in May, to make Answer to this Demand of theirs. 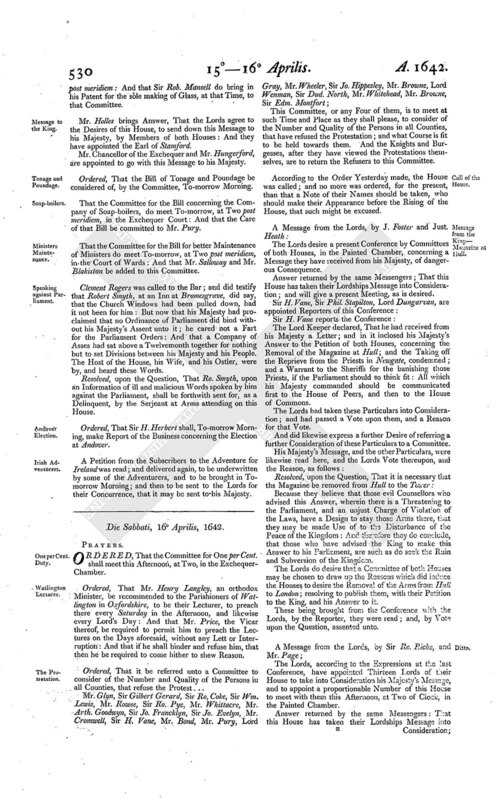 They likewise demand, that a Gentleman may presently be sent to the Grand Signior, with some Instructions concerning the Captives at Algier: And likewise that their Charter may be confirmed by Act of Parliament; with free Choice and Removal of Ambassadors, and other Officers, which are to be maintained at their Charge. Resolved, upon the Question, That the Rate now taken upon the Merchant, by the Collector of One per Cent. according to the late Act, upon Goods imported and exported, is more than Trade can bear. Ordered, That this Business of One per Cent. shall be recommitted to the same Committee, for to consider of such a Rate as Trade may bear: And are to meet upon it To-morrow, at Seven of Clock, in the Exchequer Chamber. Ordered, That the Committee for Trade shall be revived; and begin to sit on Tuesday next. Resolved, upon the Question, That an express Messenger shall be sent to Constantinople, concerning the Captives of Algiers: And that it be referred to the Committee, to consider in what Manner, and upon what Instructions, he shall be sent. Resolved, upon the Question, That a Message shall be sent to the Lords, to desire their Lordships to join with this House, in petitioning his Majesty, that the Fine laid upon Mr. Benion may be employed for the Relief of Ireland. Mr. Strode is appointed to go with it. Resolved, upon ... That the Consideration of the present Providing of Ten thousand Pounds for the Supply of Munster, be referred to the Committee for Adventurers: And that they report their Answer To-morrow Morning: And that That Committee do meet this Afternoon: And that Mr. Pym do attend that Committee; and acquaint the Committee with the State of that Province. Ordered, That it be referred to the Commissioners presently to send away the Officers of the Regiments last levied; and to give an Account hereof to the House To-morrow; and to present a List of their Names, that they may give an Account of their Stay. The Lords desire a Conference, by Committees of both Houses, at Two of Clock this Afternoon, concerning the Matter of the Conference Yesterday. The House has taken into Consideration your Message; and will give a Meeting. Ordered, That this Letter of the Three-and-twentieth of March, from the Lord President of Munster, to Mr. Speaker, and the whole Matter of that Letter, be referred to the Consideration of the Commissioners for Irish Affairs: And that a Letter from the Lord President of Munster to the Lord Dungarvon, and the Letters inclosed, be referred to the same. Ordered, That Sir H. Pallmer, and Mr. Hamond, shall be discharged from any further Attendance, until they shall be required upon new Summons. Sir Symond D'Ewes reports, That he, and Sir Beauchamp St. John, had, according to the Commands of this House, attended upon Signior Amerigo; and had acquainted him what this House had ...., in way of Satisfaction for the Wrong done unto him by some Messengers of this House: He takes the Respect very kindly; and will acquaint his Master, the Grand Duke of Toscanie, therewith. Ordered, That the Committee for the Election of the Knights of the Shire for Worcestershire, where Mr. Constantine has the Chair, be revived to sit this Day Month; and that the former Order, this Day made, concerning this Business, be made accordingly. Ordered, That the House be called To-morrow Morning, at Eight of the Clock. Ordered, That the House do sit every Morning at Eight Clock; and rise at Twelve. Ordered, That Twenty Barrels of Gunpowder shall be delivered for the Service of the County of Norfolke, by Mr. Cordwell; he being paid the Rates for the same already settled. Ordered, That Ten Barrels of Gunpowder shall be delivered by Mr. Cordwell, for the Service of the County of Devonshire; he being paid the Rates agreed upon for the same. Ordered, That the Sheriffs for the County of Norfolke shall be required, from this House, to return to London all such Sums of Money as they have received, upon the Act of Contribution for Ireland, to the Commissioners, appointed ... that Act to receive it from the several Sheriffs: And likewise, from time to time, to return all such other Sums as shall come in upon that Act, if the same which remains in their Hands, amount to One hundred Pounds, or upwards. The House went up to the Conference, desired by the Lords. Sir H. Vane, Mr. Pym, Sir Philip Stapilton, are appointed Reporters of the Conference. It was Resolved upon the Question, That this House doth agree to this Amendment of the Lords: And that these Words be struck out accordingly. Resolved, upon the Question, That a Message shall be sent to the Lords, to acquaint their Lordships, that this House has agreed to their Amendments; and to desire that this Message may be sent, with all Speed, to his Majesty, in a solemn Manner, by Members of both Houses. The Lords have commanded us to deliver you the Papers, being Draughts of Commissions from the Lord Lieutenants, to the Colonels and Captains of the Foot and Horse. The which Commissions were all severally read; and, by Vote, upon the Question, assented unto; and returned unto the Lords by Mr. Pierrepoint: Who was likewise appointed to desire the Lords forthwith to issue these Commissions to the several Officers. It is Ordered, That the Grand Committee for Grievances be revived, to sit on Wednesday next, at Two post meridiem: And that Sir Rob. Mansell do bring in his Patent for the sole making of Glass, at that Time, to that Committee. Mr. Holles brings Answer, That the Lords agree to the Desires of this House, to send down this Message to his Majesty, by Members of both Houses: And they have appointed the Earl of Stamford. Mr. Chancellor of the Exchequer and Mr. Hungerford, are appointed to go with this Message to his Majesty. Ordered, That the Bill of Tonage and Poundage be considered of, by the Committee, To-morrow Morning. That the Committee for the Bill concerning the Company of Soap-boilers, do meet To-morrow, at Two post meridiem, in the Exchequer Court: And that the Care of that Bill be committed to Mr. Pury. That the Committee for the Bill for better Maintenance of Ministers do meet To-morrow, at Two post meridiem, in the Court of Wards: And that Mr. Salloway and Mr. Blakiston be added to this Committee. Clement Rogers was called to the Bar; and did testify that Robert Smyth, at an Inn at Bromesgrave, did say, that the Church Windows had been pulled down, had it not been for him: But now that his Majesty had proclaimed that no Ordinance of Parliament did bind without his Majesty's Assent unto it; he cared not a Fart for the Parliament Orders: And that a Company of Asses had sat above a Twelvemonth together for nothing but to set Divisions between his Majesty and his People. The Host of the House, his Wife, and his Ostler, were by, and heard these Words. Resolved, upon the Question, That Ro. Smyth, upon an Information of ill and malicious Words spoken by him against the Parliament, shall be forthwith sent for, as a Delinquent, by the Serjeant at Arms attending on this House. Ordered, That Sir H. Herbert shall, To-morrow Morning, make Report of the Business concerning the Election at Andover. A Petition from the Subscribers to the Adventure for Ireland was read; and delivered again, to be underwritten by some of the Adventurers, and to be brought in Tomorrow Morning; and then to be sent to the Lords for their Concurrence, that it may be sent to his Majesty.